November 3, 2018. 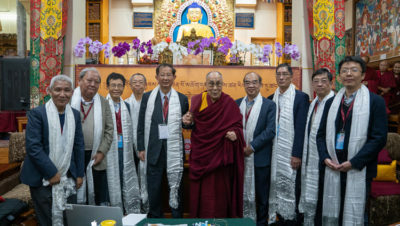 Thekchen Chöling, Dharamsala, India – Prof Yuan Tseh Lee opened the third day of discussions between Chinese scientists from Taiwan and the USA and His Holiness the Dalai Lama by expressing the presenters’ great appreciation of the opportunity. He then spoke extensively about Challenges and Opportunities for a Sustainable Planet. After drawing attention to the tremendous source of energy the sun represents for the earth, he showed a photograph of our planet from space. He reported a philosopher’s observation that seeing the world like that, free of boundaries, would inspire people to work together to protect it—has it happened yet, he asked. Prof Lee outlined the emergence of human beings two million years ago and their beginning to engage in agriculture 10,000 years ago. This led to settlements and the building of larger structures in which to live. His Holiness asked about the migration of human beings out of Africa. Prof Lee dated it as having taken place 50,000 years ago.